Virtuality Boxing © 1994 Virtuality. An uppercut above the competition, 1-2 player game on the SU2000 unit. Virtuality Boxing is a virtual world boxing experience, the object is to beat your opponent by a knockout. Players fight it out in this 'brutal' yet skilful art trying to win the Virtual Boxing Championship Title. Skillfully landing the right combination of punches will quickly wear down your opponent. All damage to the opponent's face is delivered in glorious full textured detail - flying gumshields, swollen lips, bent noses and blackened eyes! The hand held joystick is the player's boxing glove. 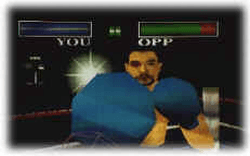 To throw a punch, a player simply throws a punch in the real world, the action is duplicated in the virtual world. Unit Description : Stand Alone POD. Other Graphical Info : support Gouraud Shading, Texture Mapping, Flat Shading. 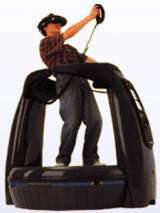 'Cybermind UK' purchased the intellectual property of 'Virtuality' in 1997 as part of a bankruptcy settlement. On Mach 2004 'Arcadian Virtual Reality L.L.C.' acquired the assets of Cybermind UK's virtual reality business.